Make familiar Bible stories new again for preteens with this collection of 30 fill-in stories that will allow students to create a crazy new story with the same powerful point. For ages 10 to 12. 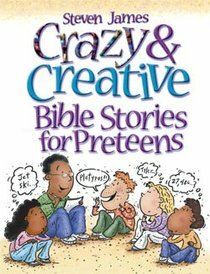 Make familiar Bible stories new again for preteens with this collection of 30 fill-in stories that will allow kids to create a crazy new story with the same powerful point. Enjoy this library of favorite Bible stories and storytelling techniques developed by award-winning author and professional storyteller Steven James. Each book includes creative storytelling techniques especially suited to help teachers tell God's story and involve children in the Bible story. About "Crazy & Creative Bible Stories For Preteens"
Steven James is an award-winning author and professional storyteller. He has written more than a dozen books and over 500 articles, stories, and scripts. Steven appears weekly at conferences, churches, schools, and special events around the country sharing his unique blend of drama, comedy, and inspirational speaking. He lives with his wife and three daughters in eastern Tennessee.